Here are the biggest, strangest, most bizarre musical instruments in the world - expect unlikely hybrids, oversized brass and an electronic badger. 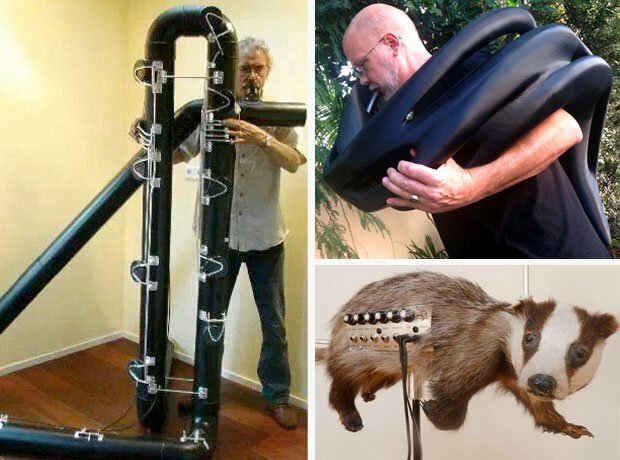 From massive flutes to sci-fi horns via electronic badgers, click through for the ultimate gallery of odd musical instruments. The hornucopian dronepipe is an entirely 3D-printed instrument designed by MONAD Studio, Eric Goldemberg and Veronica Zalcberg with musician/luthier Scott F. Hall. It's just one of a set of rather dystopian-looking instruments which together form an art installation. The other instruments are: two-string piezoelectric violin, one-string electric travel bass guitar, one-string piezoelectric monovioloncello and a small didgeridoo. How about that for some seriously low-end flute? This aptly named flautist foghorn is the largest member of the flute family, containing over 15 metres in piping. It's a relativeley new instrument and, according to early reports, the tone is still under refinement as it's a bit growly. We don't care. It's massive and weird. Constructed in 1850 by certifiable genius and fan of massive string instruments Jean-Baptiste Vuillaume, the Octobass is a chuffing massive double bass that stands at 3.48m tall. Which is ridiculous, really, seeing as it's too big to play with the hands - there are elaborate foot-pedals to make it possible. Apparently Berlioz was a fan, and wrote about it in his treatise on orchestration. Otherwise known as the fire organ or the explosion organ (seriously), the Pyrophone Organ is powered by combustion. Which means that, to play it, a certain part of it needs to be on fire. Of course, it's all perfectly safe - the organ itself can be powered by propane and gasoline, and the explosions that force exhaust down the pipes to make the sounds can be regulated. But still, it's an explosion organ. Best stand back. Henry Dagg has one of the coolest sounding job titles ever - Sound Sculptor. In his amazingly awesome role as Sound Sculptor, Dagg invented the equally cool-sounding instrument known as the Sharpsichord. It's actually a gargantuan pin-barrel harp that contains 11 cylinders, and the pins strike internal strings as they rotate. Invented by the superbly named Leland W. Sprinkle in 1956 and situated in an underground cave in Virginia, the Great Stalacpipe Organ works by tapping on ancient stalactites with rubber mallets, all connected to a console that looks like a traditional organ. One of the popular stories surrounding the invention of the organ says that Sprinkle got the idea when his son hit his head on one of the stalactites, producing a low, vibrating hum from the cave. This barmy yet ambitious project sought to turn the sea itself into a musician by using the reconstructed seafront in Zadar, Croatia as a ginormous organ. Pipes underneath the promenade react to the waves as they crash in, creating harmonious sounds that tourists flock to come and experience. The brainchild of legendary tubist and general low-end enthusiast Jim Self (with the help of brass manufacturer Robb Stewart), the Fluba is exactly what you might imagine it is - a hybrid of a flugelhorn and a tuba. Which means it's a tuba-sized flugelhorn. Self-explanatory, really. Here's Jim himself giving it some welly. The daddy of weird instruments, and one of the very first times electronics were used specifically to create music. Notable for its eerie sound, contact-less playing technique and its use in science fiction movies, Leon Theremin (great name) went down in musical history for this one. It was used memorably in Miklós Rózsa's soundtrack for Spellbound and The Lost Weekend, and Bernard Herrmann's soundtrack for The Day the Earth Stood Still.